The City of Boulder was founded in 1859. 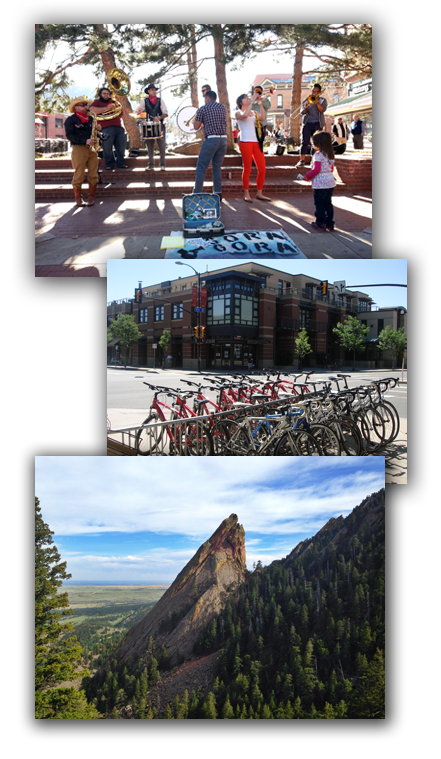 Nestled at the base of the foothills, with the Rocky Mountains just to the west and the rolling plains to the east, Boulder sits at an elevation of 1,655 meters/5,430 feet above sea level, and covers 73 square kilometers/28 square miles. 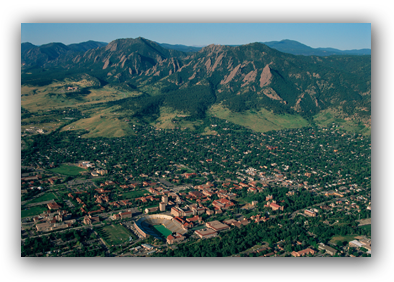 Boulder has a population of 102,500 residents, including 25,000 students at the University of Colorado (pictured to the right). Boulder is a 45-minute drive from Denver. SuperShuttle runs from the Denver International Airport to Boulder on a regular schedule. You may make a reservation at www.supershuttle.com, or by calling 1-800-258-3826 (1-800-BLUE VAN). After picking up their luggage, guests should go to the SuperShuttle counter on Level 5 of DIA's West Terminal (same floor as luggage). They will pick up their ticket and be directed to the shuttle. Green Ride Boulder is a locally-owned and operated business. We are focused on resource sustainability and minimal environmental impact. 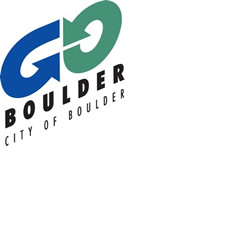 The City's Go Boulder program provides lots of information to help you get around town without a car. Our community's nonprofit bike-sharing system, B-Cycles are magic bikes that are always ready to ride, where and when you need them. Conference attendees (and UCAR staff) can ride free. Download this Boulder Cycle flyer, you can register yourself for a free annual membership. If you encounter any problems with registration, don't hesitate to contact Boulder B-cycle's customer service line during business hours: 303-532-4412. You can also contact Chelsea Castellano at 303-497-8549 or sustainability@ucar.edu. RTD Bus service, administered by the Regional Transportation District (RTD), includes numerous routes in Boulder, as well as convenient connections with Denver and other nearby cities and towns. For assistance with routes and schedules, visit RTD's website or call 303.299.6000.